I have been doing quite a bit of research lately on various techniques for paper crafting. I am very inspired by the Tim Holtz Distress Inks and Paints line of products. Shown below is my first tag created using the Distress Inks and Paints. There are actually two tags in this project; the main background one and a smaller one that was cut up into pieces to look like a window pane. 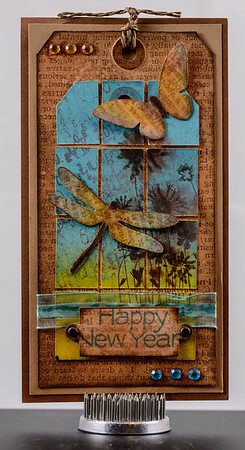 The butterfly and dragon fly are die cuts from the first main background tag I made which I didn’t like. Lesson learned: Don’t throw anything out that may come in use for your current project or one in the future. Keep those “mistakes” in a bin and look in it when working on a project.